A Hack-proof, Crash-proof, Stable Cousin to Bitcoin? One of the major investment stories of the year is the dramatic rise in the popularity, and price, of various “cryptocurrency” options. Volatility in their pricing, along with security of the digital wallets, which hold the funds, are two main resistance factors preventing the science fiction-esque payment methods from gaining widespread acceptance. Be durable. It must stand the test of time, and not fade, corrode, or materially change. Be portable. It must have high “worth-to-weight” ratio considering heaviness and size. Be divisible. It must be easy to split, combine, and distribute without affecting its fundamental nature. Be intrinsically valuable. It must have value independent of anything else, including its own contents. So, how do the cryptocurrencies stack up against this definition? If you ask me whether Bitcoin, Ethereum, or a host of other cryptocurrencies meet those criteria, I suggest the answers are “maybe”, “yes”, “yes”, and “maybe”, again. Consider the prospect of a truly far-reaching military conflict, along the lines of World War II in devastation and global involvement. Or, on a smaller scale, a power grid failure, minus the impact of something even more debilitating in our modern life, such as an EMP. Would cryptocurrency still be “durable” if you cannot access your digital wallet? Would there still be widely-accepted “intrinsic value” in the midst of a panic? There is, however, another option which shares many of the same features as any cryptocurrency of choice, with almost none of the “maybe” downsides. 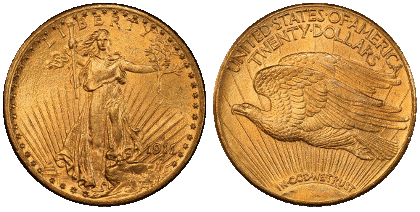 More specifically, numismatic items like the $20 Saint-Gaudens gold coin. Right now, we believe the MS64 $20 “Saint” is still one of the best long-term buys in the denomination, but the price is on the rise. The MS64 Saint is ideal for investors who are looking for both wealth insurance and profit motivation at a great value. The MS64 grade does not cost much more than lower graded $20 Saints. In fact, if you look at common dates in just one grade lower (MS63), the price difference is about 3%. Throughout 2017, prices for MS64 $20 Saints have steadily crept up to their current levels. This is despite downward pressure from multiple sources, most notably the Federal Reserve interest rate increases and frenzied interest in the "get-rich-quick" cryptocurrency market. From the 1790s through the 1930s, American gold coinage served as the backbone of our country’s financial system. Before money existed in the form of paper notes or electronic records, large sums of money were held in the form of trusted, internationally recognized United States gold coins. Copper, nickel, and silver may have been used for routine daily spending—but nations, banks, and large institutions chose American gold as their preferred investment. The role of gold coinage was altered significantly when President Franklin Delano Roosevelt passed Executive Order 6102 in 1933. This edict prohibited both the minting and hoarding of American gold coins. The official stated reason for the order was the “hoarding” of gold was stalling economic growth and worsening the Great Depression. In reality, however, the order allowed the Federal Reserve to dramatically expand the money supply without constraint. We still have the same problem today, but it is magnified considerably. The limitation on gold ownership ended in the 1970s—and classic U.S. gold coins quickly found new life as collectibles and investments. The demand for classic (aka “pre-1933”) U.S. gold coins became robust, but the supply was often limited. Unlike modern bullion products, such as American Eagles and Canadian Maples, the supply of classic U.S. gold is finite. No more can be made to keep pace with demand. When pre-1933 gold is in vogue, premiums for these items can expand considerably. As a result, premiums over melt spiked during periods of strong demand and extreme volatility. In softer markets, premiums would return to more normal levels. We’ve watched the premiums for classic U.S. gold expand and contract dozens of times over the years. However, premiums now seem to be on the rise from their historic lows. As of early 2017, pre-1933 gold coins had not been so close to the melt price (based upon gold content) at any point in the past 10-15 years. 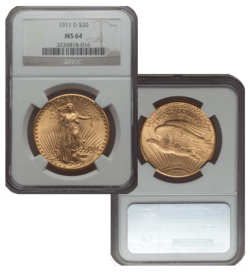 Even with the recent rise in prices, such low premiums make pre-1933 U.S. gold one of the best opportunities in bullion or numismatics. At a weight of 516 grams and a purity of .900, you can hold .96750 ounces of pure gold in your hand—at some of the lowest price we’ve seen all year! Today’s premiums represent a superb entry point for classic U.S. gold. The combination of low premiums and low spot prices is extremely unusual. These conditions offer two ways to profit from pre-1933 gold: a rise in spot prices and/or premium increases. In fact, if history is any indication, a sharp rise in gold spot price could trigger significant premium expansion. This phenomenon has repeated itself many times in the past. If you wish to own a classic piece of American history, renowned for its beautiful design, we can now offer you $20 Saints for as low as $1,449 per coin*. FREE shipping is also available when you buy a minimum of five $20 Saints. Unlike cryptocurrencies, which are unlikely to satisfy all of Aristotle’s criteria in the case of a grid failure or EMP attack, physical gold is one of the most secure investments you can make. Because there is only a finite supply, gold will always hold its worth. To take advantage of the unique combination of low premiums and low gold spot prices, call us at 800-831-0007 or email us to invest in $20 Saints. *Prices subject to change based on market fluctuation and product availability. Prices reflected are for cash, check, or bank wire. FREE shipping when you buy a minimum of five $20 Saint-Gaudens. Please call for pricing on purchases of four coins or less. Offer expires July 21, 2017.